The emerging schism between the West and the Islamic world makes America’s relationship with Turkey—a Western-oriented, democratizing Muslim country—more important than ever. Unfortunately, despite the long history of close collaboration, U.S.-Turkish relations have deteriorated markedly over the last three years. The U.S. invasion of Iraq—and the potential consequences for Turkey with its large Kurdish population—is the primary issue that divides Washington and Ankara, but there are also differences regarding Cyprus, Syria, Iran, Israel, and Hamas, as well as a rising tide of anti-Americanism in Turkey. To repair this important alliance relationship, Washington should establish a regular trilateral dialogue involving the United States, Turkey, and Iraqi Kurds; play a leading role in seeking a settlement to the long-standing dispute over Cyprus; be more active in supporting Ankara’s bid for EU membership; and work to create a U.S.-Turkey Cooperation Commission that would meet on a biannual basis to provide a structured forum for government agencies, NGOs, and private sector leaders from both countries to discuss matters of mutual concern. Letters posted May 21, 2007. We write in reference to the Council on Foreign Relations report Generating Momentum for a New Era in U.S.-Turkey Relations [Council Special Report No. 15, June 2006] by Steven A. Cook and Elizabeth Sherwood-Randall. We believe that the CSR in question presents a deeply flawed policy prescription for the United States. The stated purpose of CSR No. 15 is to seek ways to give new impetus to the cooperation between the United States and Turkey or, more exactly, to secure Turkish assistance in the pursuit of U.S. foreign policy goals. As Council President Richard N. Haass posits in his Foreword, persuading others to support—or at least not oppose—American policy contributes greatly to its success. The proposition is undeniable and all would agree that good relations between the United States and Turkey are desirable and worth striving for. Yet the authors of the report go beyond that, stating that Turkey’s strategic importance is “more important than ever.” To prove this, the authors note that while the collapse of the Soviet Union weakened the rationale for the traditional close alignment between the two partners, the challenges presented by the growing schism between the West and the Islamic world provide a new motive for solidarity analogous to the polarities of the Cold War. In the new shape of things, Turkey’s location and role as a “western-oriented, democratizing Muslim country,” acquire special significance for U.S. policy. The proposition that the threat of militant Islamism structures world politics in a manner analogous to the Cold War divisions is doubtful, or, at best, oversimplified. The report ignores the factors that led to the rise of militant Islam. Many of those factors resulted from the consequences of American policy toward the Arab world. Without taking those factors into account, no rational analysis of the tensions in the area and hence, of Turkey’s interests, can be possible. It is clear, however, that whereas the strategic interests and common defense posture of Turkey and the United States against Soviet communism coincided, the same cannot be said of the new challenges presented by militant Islam. These challenges are experienced and evaluated differently by the two countries. It is incorrect to assume, as implied by the report, that the difficulties created by militant Islam—which primarily affect the governance of Muslim countries—can be equated with a communist threat centrally directed from Moscow, whose objective was to subvert the Western system. While the United States and some of Europe may agree that the sociopolitical forces gaining strength in the Middle East and Islamic world can be summed up by the catch-all term “militant Islam,” the regional players are much more measured in their descriptions and, thus, in their foreign policy prescriptions. While the report’s general tenor emphasizes the common ground between Washington and Ankara in dealing with militant Islam, it offers few other areas of real cooperation or agreement between the two allies. In fact, the report’s analysis of the current relationship actually substantiates the significant divergence in the two allies’ current postures and interests. For instance, it is accurate to say, on the one hand, that both the United States and Turkey have interests in the Balkans, the Caucasus, Iran, Iraq, the Middle East, and Central Asia, but inaccurate to assert that these are common or coinciding interests. Thus, as the report outlines, Turkey’s cautiously cordial, pragmatic relations with Syria and Iran reflect its traditional stance as a status quo power in the Middle East. Similarly, Turkey’s shared concerns about the Kurdish question are incompatible with confrontational American policies that seek transformation in the Arab world. Turkey is unwilling to follow, and reluctant to support, U.S. preemptive interventionist policies precisely because such policies, in Ankara’s view, will destabilize the neighborhood in which Turkey dwells. Turkey will not further American policies precisely because such policies harm Turkish interests. Turkish public attitudes—and, thus, Turkish government policy—toward organizations such as Hezbollah and Hamas differ significantly from those of the United States. Other factors, such as the virulently anti-Israeli sentiments of the Turkish public and media, are linked directly to the current unpopularity of the United States in Turkey. To take another example, it may be true that in some anthropological-linguistic sense the newly independent Central Asian republics are “part of the Turkish world.” They are, however, even more marked by their thousand-year historical divergence and the more recent Soviet experience and now by the forces of globalization. The report ignores this fact; as it does the fact that Ankara’s “anticipated … effort to promote economic and political development of the Central Asian countries” has not gotten very far. It is not evident, therefore, that Turkey would be a particularly useful broker for the United States, be it in economic or security terms, to deal directly with the Russian “near abroad.” Here, too, there seems little scope for substantive common interests. In fact, U.S. transformational objectives directly threaten the overriding Turkish interest in promoting regional stability. The report states that “ Turkey has felt threatened by growing instability in its neighborhood” while ignoring the fact that Turks generally believe U.S. policies to be the source of that instability. Yet the report itself shows that in marked contrast to current American policies, Turkey seems set on finding pragmatic paths of accommodation with its Arab neighbors and Iran, and determined to go its own way in her relations with them. Regarding Iraq, the report notes that the Turks are displeased that they were not properly consulted and that their misgivings about invading Iraq were dismissed out of hand. They are even more upset now that their fears seem to have been proven right. The report highlights the paramount and interconnected security concerns of Turkey: the possible emergence of an independent Kurdistan in a dismembered Iraq, Kurdish separatism in Turkey itself, and Kurdistan Worker’s Party (PKK) violence. The report also correctly points out that given current U.S. policies and the situation on the ground in Iraq, American support for the Turkish positions on these questions is likely to be weak. Ultimately, the report presents instances of common purpose that are few and ambiguous. To say that both the United States and Turkey wish to see the consolidation of a stable, federal Iraq overstates the extent of common outlook. Turkey depended on a centrally ruled, unitary Iraq to prevent regional separatism that threatened Turkey. At best, Turkey sees our efforts at cobbling together some kind of Iraqi federation as an attempt after the fact to salvage what is possible of an Iraqi unity brought to the brink of disintegration by a military intervention they opposed. At worst, many Turks believe that American policy from the beginning aimed at breaking up Iraqi national unity in pursuit of American regional interests and ignoring Turkish concerns. That the United States concurs with Turkey in considering the PKK a terrorist organization seems to Turks an empty verbal gesture. Despite a few spectacular American actions such as the delivery of Ocalan, they question American motives and bristle at what they believe are double standards in the pursuit of the global war on terror. Why, they ask, do the Americans allow (and indeed encourage) the Israeli incursions into Lebanon in pursuit of Hezbollah, but prohibit the Turks from pursuing the PKK in Iraqi Kurdistan? The United States, furthermore, added insult to injury by handcuffing and hooding Turkish commandos that fell into their hands. Conversely, the U.S. administration in Iraq mistrusts and rebuffs offers of Turkish troops assisting in Iraqi reconstruction. The United States is ill at ease with Turkish concerns with controlling developments in the north of Iraq, rather than with containing disorder where it most matters to the American command. The United States fears that Turkey will disturb a situation in the only area of that unhappy country that is stable and comparatively favorable to American aims. The report identifies the refusal of the Turkish parliament on March 1, 2003, to allow passage through its territory of U.S. troops destined for the Iraqi war as a watershed in U.S.-Turkey relations. The report asserts that the public row between the United States and Turkey over the establishment of a northern front into Iraq led to strong anti-American sentiments in Turkey on the one hand, and a loss of faith in Turkey as a reliable ally of the United States on the other. This decision undoubtedly brought to the fore and perhaps exacerbated the differences between the two countries. But we argue that it did not create them. The divergence has deep-seated structural causes that cannot simply be wished away. In fact, the Cyprus question is not presented as a field where American and Turkish interests coincide. Rather, the authors argue that this issue, unlike the Kurdish issue, is one where the United States, unimpeded by substantive interests, strategic considerations, and tactical constraints of its own, is free to support the Turkish position with a view to gain favor with Turkey. Somewhat more broadly, the report asserts an American interest in a settlement of the Cyprus dispute not on its own terms and merits, but as a means to facilitate Turkish accession to the European Union on Turkey’s terms in order to renew Turkish support for U.S. objectives outside Europe. The report asserts without examination that it is in the U.S. interest to see Turkey in the EU; that simply “anchoring Turkey in the West” through an EU that is not in lockstep with U.S. policies is in the American interest. We agree that in the long term, Turkey’s accession to the EU is in the interests of all parties. However, it is interesting that the authors ignore the constraints that EU accession will put on Turkey’s future ability to conduct an independent and pro-American foreign policy. Undoubtedly, earlier American support among reluctant European countries was important in promoting Turkey’s candidacy, and helped lead to the opening of the formal process. The EU process has been beneficial to political and civil liberties in Turkey and its continuance remains an important engine of legal and economic reform, though the United States has never pressed for such reform. The report ignores the fact that Greece’s decision to reverse two decades of policy and support Turkish accession to the EU owed little to American policies and more to Athens’s reassessment of its own interests. For the same reason, to promote the entry of Turkey into the EU regardless of its fulfillment of the Copenhagen criteria does great disservice to the Turkish people and, more importantly, may ultimately scuttle Turkey’s accession. A perceived U.S. attempt to force Turkish EU membership without meeting the EU’s requirements provokes resentment and backlash among European member countries. It also damages the aspirations of the Turkish people for democratic progress. The Turkish elite’s attitude is driven in large part by conflating its expectations of the European Union as the lodestone of Turkey’s westernization with Turkey’s experience with NATO as a military alliance. European integration is based, however, on a different model. It is neither an alliance nor a failed federation. It extends its area of peace and prosperity by means of subsidiarity and interdependence. It will not have the desired effect on structural change and transformation of the political system in Turkey unless its rules are upheld. A Turkey that embraces and lives up to the European acquis will strengthen both Europe and itself. A Turkey that does not will fail to become a true modern democratic state. Hence a rational American policy in support of Turkish membership needs to be as much pressure on Turkey to meet European standards as it is pressure on EU members to accept Turkey. It cannot mean “taking Turkey’s side” in the hope that the resulting Turkish goodwill would enlist Turkish compliance and assistance in U.S. regional projects extraneous to Turkey’s European interests. The EU will resist pressure to admit a Turkey that does not fully embrace the spirit that animates the EU. Thus, American pressure on Europe to accept a Turkey that refuses to conform to the European acquis only undermines the Turkish case for EU membership. In support of their argument, the authors attach a curious map that labels only countries in the Middle East and Central Asia and substitutes blank spaces for Turkey’s European neighbors. This map illustrates the perspective of the authors and not that of Turkey, which has been firmly oriented toward the West ever since the time of Turkey’s first president, Mustafa Kemal Atatürk. The authors, to convince an American audience, try to demonstrate a Turkey that faces east and south, toward the area of current U.S. preoccupation. In other words, the authors subordinate Turkey’s western vocation to its potential value as a base of U.S. power projection in the Islamic world. There are more contradictions in the American drive to promote Turkish EU membership. The process of European integration embraced by the presently governing Justice and Development (AK) party, by requiring reforms, creates the space necessary for the new democratic political forces to maneuver. Conforming to the acquis ultimately requires Turkey to dismantle Kemalist civilian and military “deep state.” The report ignores the real changes that have already taken place that affect the mobilization of public opinion and of hitherto acquiescent sectors of Turkish civil society. Effective communication with Turkish society can no longer be restricted to the exchange between military and political elites, on which Turkish-American strategic cooperation has traditionally relied. The days of dealing with Turkey almost exclusively through the army are gone. The debacle of March 1, 2003, is in large part due to American failure to take this new situation into account. Observers need only read one of the many Turkish news articles detailing then Undersecretary of Defense Paul D. Wolfowitz’s disastrous public comments threatening the Turkish government with recourse to their own military if the referendum were rejected by their democratically elected Grand National Assembly (which it was) to get an idea how out of step the United States was with Turkish politics. If Turkey moves forward on its European path, it will develop into an increasingly complex partner for the United States. The late and unlamented simplicities of automatic strategic solidarity no longer obtain. Promoting Turkish accession to the EU is a sound policy, but it will not create a capital of unambiguous loyalty on which the United States will be able to draw for its own purposes, precisely because Turkey will be transformed. Confusion arises when we conflate Turkey’s western orientation with its alliance with the United States. The authors repeat the simplistic mantra that Turkish attachment to the West dates to the Korean War. In fact, Turkey’s impetus to join the community of western nations—i.e., the efficient and productive modern world, leaving behind Ottoman obscurantism—is inscribed in the very foundation of the secular republic. Turkish President Ismet Inonü’s neutralist maneuvering between the warring parties in World War II was no rebuff of the West, the Axis powers being no less western than the Allies. Rather, Inonü sought to secure his goals of modernization by serving the national interest during a conflict of uncertain outcome. The realities of power and conflict in the post–WWII era only later led to rearticulating the Turkish aspiration to the status of a western nation through a Cold War alliance with the United States and Western Europe. Adherence to NATO became the main expression of Turkey’s attachment to the West, in terms of its own self-understanding as well as in terms of its acceptance by its allies. Participating in the UN expeditionary force in Korea, the inevitable starting point of all stories of Turkey and America “standing shoulder to shoulder,” was the ticket to NATO membership for a country at some distance from the North Atlantic, overcoming considerable reluctance of West European allies. It should not come as a surprise that in the post–Cold War era, American-led NATO, though still a significant point of reference, should yield to the EU as the preferred vehicle of Turkish westernization. Turkey’s path to Europe will be arduous. Failure could mean a revival of nationalism based on offended pride and the growth of more radical forms of political Islam. These would be unfortunate developments that would isolate Turkey. But it is disingenuous to fear that Turkey would then embrace “alternative partners.” The great bulk of Turkey’s trade partners and creditors are in the West. Turkey can hope for serious investments from no other source. The Central Asian Turkic Republics will buy neither its towels nor its bonds. Even Islamic sympathies find their limit in ancient patterns of Turkish arrogance toward Arabs and in the residual strength of entrenched Kemalist secularism willing and able to intervene by force of arms if necessary. Turkey will be with the West, or, despite the rhetoric of fear generated by the Kemalists and their friends in the United States, it will be alone. It is to such an ambiguous cause, then, that Cyprus is offered up as a propitiatory gift. To buttress their argument, the authors create an image of the Cyprus question foreshortened in ways that make the report partial in both senses of the word. Turkish troops did indeed invade Cyprus in 1974 in response to a Greek-inspired coup d’état. The coup was undertaken against President Makarios and Makarios did invite such intervention (though he obviously had Britain in mind). Turkey claimed the right under the Treaty of Guarantee to intervene militarily to uphold the Cypriot constitution and independence and to restore the status quo. Within one week the legitimate government of President Makarios was reestablished. Restoring the status quo ante, however, was neither Turkey’s real purpose nor the effect of its intervention. Turkey’s intentions became clear that August, when it launched, without provocation, the second invasion in violation of its own commitment to the UN-mandated cease-fire. This second round led to the occupation of two-fifths of the island and to a flood of some 170,000 refugees. Then U.S. Secretary of State Henry Kissinger agreed with Turkey’s assertions on its right to intervene and refused to act to stop the initial July invasion. Even Kissinger did not assert an excuse for our failure to intervene in August and, in fact, there is considerable evidence that the U.S. administration knew about the second invasion and took no action to stop Turkey. Under the circumstances, American inaction and the declaration of “equidistance” between the contending parties amounted to a decisive tilt in favor of Turkey and its occupation of northern Cyprus. Turkey has consolidated and expanded its military hold on Cyprus in the thirty-two years since the invasion to the point that one in almost five inhabitants of northern Cyprus is a Turkish soldier. A program of settling Anatolian farmers on formerly Greek Cypriot homesteads seeks to bring about a demographic fait accompli beyond the one created by the forceful ethnic separation effected by the invasion. The most reliable estimates indicate that Anatolian settlers and the Turkish occupation forces now outnumber Turkish Cypriots by a two-to-one ratio (approximately 80,000 Turkish Cypriots versus 140,000 settlers and 40,000 to 45,000 Turkish troops). This, in turn, raises the question of the legitimacy and validity of the pro-Annan Plan vote in the occupied areas of Cyprus. Even this report acknowledges that the unilateral declaration of a “Turkish Republic of Northern Cyprus” recognized only by Ankara aggravates the situation. The authors wish to give the impression that both sides have equally hampered negotiations an attitude that cannot be supported by the historical evidence. The authors further mislead by asserting that the Greek Cypriots demand the reunification of the island under a single “Greek-dominated” government. While the government of the internationally recognized sovereign Republic of Cyprus has asked for the reinstatement of its authority over the whole island, it has also formally and explicitly recognized that this would require workable constitutional arrangements that provide adequate assurances for the security and liberty of the Turkish Cypriot community. In this regard, Cyprus accession to the EU by itself creates the best current regime worldwide to protect Turkish minority rights. Given such guarantees, it is not unreasonable to expect the government to reflect that Greek Cypriots outnumber Turkish Cypriots by more than four to one. Commenting on the Annan Plan, the report makes the astonishing remark that its provisions were “all to the benefit of the Greek Cypriot side.” Nowhere can we find any justification for this statement. The Annan Plan’s nine-thousand-page proposal to establish a federation of two constituent states would have required the renunciation by the Republic of Cyprus of its internationally recognized sovereignty, reducing it to one of two subordinate cantons, on a basis of parity with the self-proclaimed Turkish Republic of Northern Cyprus. Four-fifths of the Cypriot population would have been placed on an equal footing with the one-fifth. Territorial adjustments would have rectified some of the losses inflicted by the invasion, yet compensations for losses on either side were to be paid by the federation to be established. The Greek Cypriots, being more numerous and much richer than their Turkish Cypriot counterparts, would in effect, in the name of reconciliation, be compensating themselves. The Annan Plan was also incompatible with Cypriot membership in the European Union. The jurisdiction of the European Court pertaining to property rights, freedom of movement and other human rights issues would have been curtailed. Acceptance of the Annan Plan would have formally recognized the continued presence of large Turkish forces on the island and left the proposed federation exposed to their force. Finally, the argument could be made that acceptance of the Annan Plan would have rendered Cyprus in violation of the EU acquis and provided an excuse to stop its accession to the EU. It can be said that the Annan Plan would have exported the Kemalist “deep state” to Cyprus. The system of vetoes and quotas proposed by the plan in favor of the minority—extending to every level, not only of government but also of everyday administration—was bound to lead to deadlock. In fact, the Annan Plan was a more complicated and unworkable version of the original 1960 Cypriot constitution. It would have inevitably led to deadlock and renewed civil strife. It is easy to see why the Greek Cypriots rejected reunification at that price. In the years since the invasion, the Greek Cypriots, essentially unassisted from the outside, absorbed an enormous number of refugees from the north, created a vibrant economy sustained by an efficient public administration, and achieved a per capita income higher than that of Greece and Israel, let alone Turkey. The Republic of Cyprus satisfied all the structural conditions for admission into the EU, outpacing in that regard all the eastern European newcomers. Some political actors argue that by admitting Cyprus without an a priori requirement to settle the Cyprus issue, the EU no longer has a way to compel such a settlement. That argument is fallacy. The EU took deliberate and unanimous action at the Helsinki summit in 1999 to admit Cyprus with or without a political settlement because to do otherwise would have in effect given Turkey, a non-EU member, a veto over EU enlargement. It is unrealistic to think that the EU would have ever imposed such a condition. If anything, the United States’ and Annan’s pressure only steeled the EU’s resolve to admit Cyprus without conditions. Further, we argue below that Cyprus’s accession to the EU was a key factor in Greece’s reversal in favor of supporting Turkish accession. Leaving aside for the moment the benefits to Turkey’s EU aspirations made possible by Cyprus’s entry, U.S. and Turkish political leaders should note and make use of the Republic of Cyprus’s continued desire to reach a settlement despite the rejection of the Annan Plan. Even if Nicosia didn’t want to pursue an accommodation, the system of granting and withholding rewards, in the form of subsidies, regulations, legal sanctions, etc., is such that Brussels always has a great deal of influence on the policies of the EU’s several members. The EU’s influence will no doubt play in favor of seeking a resolution of the island’s division and the reintegration of northern Cyprus. But this will occur in connection with the progress in the process of Turkey’s accession and in terms of protecting and furthering the EU’s acquis. To expect Turkey to open its airspace and seaports to one of its members in good standing “out of principle” is not perverse rigidity that turns its back to seeking a settlement, but the modus operandi of European integration, creating the conditions for the possibility of a broader settlement. The authors surprisingly fail to note that the Turkish government explicitly agreed to this provision and then reneged, most observers agree, because of a threat from the Turkish military. It is not self-evident that Nicosia needs to be compelled to negotiate in good faith, unless it be admitted that all negotiations are subject to pressures and constraints. One major such compulsion is, surely, the continued presence of Turkish troops on Cyprus. Rather than lament that the access of Cyprus to the EU was not made conditional on previous reunification, the report should have acknowledged that the formal acceptance of Turkey as a candidate state was made possible by decoupling Cypriot reunification and EU membership. The position adopted by Greece at the Helsinki summit favoring Turkish membership—on condition, of course, of meeting the Copenhagen criteria—has been crucial to the Turkish candidacy and far more effective than any U.S. government pressure. The decoupling was one of the conditions necessary for this change of the Greek position that is essential to Turkey’s European prospects. The solution of the Cyprus problem has not become more difficult since Nicosia’s accession to the EU, as the report contends. It has only become more difficult to settle on the terms dictated by the Kemalist elite which have the ear of Washington policymakers. The report also asserts inaccurately that the Greek Cypriot leadership sought to discredit the Annan Plan in the campaign leading up to the referendum. In fact, despite their misgivings, major political figures such as former Presidents of the Republic George Vassiliou and Glafkos Clerides campaigned in favor of acceptance, believing that the fact of an agreement was politically and diplomatically more important than its detailed provisions. The decisive moment was the shift of the Progressive Party of Working People (AKEL), the leftist party that commands the loyalties of a solid third of the Greek Cypriot electorate. Traditionally in favor of accommodation with the Turkish Cypriots, AKEL joined the winner of the presidential election in opposing unification under the Annan Plan. This shift, like so many mutations of political allegiances in the region, reflects the obsolescence of Cold War alignments. Conversely, the leader of AKEL’s sister “worker’s party” in northern Cyprus, Mehmet Ali Talat, supplanted the nationalist Turkish Cypriot leader, Raouf Denktash, whose decades of intransigence had doomed bilateral and multilateral negotiations. Despite the incentive of joining the prosperity of the south and of Europe beyond it, a smaller percentage of Turkish Cypriots voted in favor of the Annan Plan than Greek Cypriots who voted against it. All parties had accepted UN arbitration with ultimate recourse to separate and simultaneous referenda in the two communities. That placed the onus of rejection on the Greek Cypriot electorate. The fact that the UN Secretariat ignored the positions presented by the Cyprus government during the final negotiation of the Annan Plan but, by contrast, incorporated almost verbatim all eleven points advanced by the government of Turkey further inclined Cypriots to vote against the plan. This made it rhetorically, though unjustifiably, easier to cast the Greek Cypriots in the role of spoilers and to call for them to be punished. The report, alas, adopts that rhetoric. It proposes that future efforts at resolution be based on yet another version of the Annan Plan, ignoring the fact that it is unworkable and so inequitable as to be certain of defeat in any future referendum. The anger at the plan’s rejection seems to reflect more the frustration of Kofi Annan’s team of advisers, who worked for a decade on a proposal that ignored reality and the changes in the world since 1974. Its defeat was never merely an act of capricious defiance. The report recommends the unquestioned acceptance of the Turkish plan of action on the Cyprus question. It salutes the many steps already taken by the U.S. government amounting to a gradual and increasingly formal recognition of northern Cyprus and the consequent consecration of the island’s partition. It urges moving EU governments to use their collective clout to bring to heel the Cypriot government, as though no concessions were needed from the other side. It even demands the help of Greece, not, as would be more than appropriate, in developing a dynamic cooperative process of rapprochement in the region, but in one-sidedly exerting pressure on Nicosia. The authors of the report advocate a series of steps, including accommodation of Turkey’s position toward Cyprus reunification, as a means of transforming the U.S.-Turkey relationship. In so doing they trivialize the rules that the EU seeks to uphold as quaint niceties subordinate to the greater good of American political demands that in turn placate Turkish demands. The fact that such demands antagonize European opinion and undermine Turkey’s chances of accession seems to have escaped the authors’ attention. The only visible American interest advocated by the report seems to be gaining Turkish favor. While the authors argue that this is a means of gaining “momentum”—to borrow their phrase—in advancing U.S. and Turkish interests, they have failed to tell us where that momentum leads or how either party will benefit in the future. The authors seem to believe that such favor would miraculously translate into tangible support for American projects that the Turks themselves believe to be bad for Turkey. They ignore the probability that Turkey would take what support it can receive in the Cyprus question simply as its due and proceed to conduct its foreign policy according to its own distinct perception of its interests, as it has done throughout the history of the Turkish Republic. We thank Messrs. Theros, Coufoudakis, Moulakis, and Rossides for taking time to comment at length on our report, Generating Momentum for a New Era in U.S.-Turkey Relations (Council Special Report No. 15, June 2006). We are pleased that there is much we agree upon, including the importance of strong U.S.-Turkey relations, an equitable resolution of the Cyprus conflict, and the integration of a democratic Turkey into the European Union. However, it is clear that there are considerable areas of disagreement between our report and the views of Mr. Theros and his colleagues that deserve specific attention. First, Mr. Theros and his colleagues misrepresent our argument about what we call “the growing schism between the West and the Islamic world.” Far from advocating a global struggle between the West and Islam, one of the reasons we believe that Turkey is so important to the United States and the West is that Turkey plays important and influential roles in both the Western and Islamic worlds and can serve as an important bridge between them. It may, in fact, be a cliché to argue that Turkey is a bridge, given the important differences between Turkey and the Arab world and the Muslim societies of Central, South, and Southeast Asia. Nevertheless it is important to note that the Arab world, in particular, is watching Turkey’s drive for EU membership and how the United States is handling current events in Turkey with keen interest. Many Arabs from across the political spectrum see EU membership and where Washington stands on Turkey’s current political impasse as an important test of the West’s tolerance toward Muslims. Moreover, Mr. Theros and his colleagues imply that we are alarmist in our reference to the gap between the West and the Islamic world. Given the overwhelming evidence of this significant gap, we believe our concern is well founded. In this disquiet we find ourselves in company with such prestigious organizations as the Brookings Institution, Carnegie Corporation, German Marshall Fund of the United States, Open Society Institute, Pew Charitable Trusts, Rockefeller Brothers Fund, Smith Richardson Foundation, and a variety of other reputable think tanks and foundations that have devoted considerable intellectual energy and financial resources to understanding, and seeking to reduce, the growing gap between the West and the Islamic world. We agree with Mr. Theros and his colleagues that Washington and Ankara maintain different diagnoses for the crisis in relations between the West—and in particular the United States—and the Islamic world. Yet this makes Turkey no different from other critically important allies such as France, Germany, Indonesia, Egypt, Saudi Arabia, and Qatar. Second, neither we nor the report advocates a “ U.S. attempt to force Turkish EU membership without meeting the EU’s requirements” for membership. We stand by our basic point that the United States should continue to impress upon its European allies the strategic importance of Turkey’s inclusion in the European Union. However, it is not true to argue that the report calls for this membership to be granted without Turkey’s fulfilling its commitments to Brussels. It is important to point out, however, that by late 2004, Turkey had met all legal requirements—the Copenhagen criteria—to begin membership negotiations. If Ankara had not, the EU Commission would not have recommended that the Council of the European Union offer Turkey a date to begin membership negotiations. The report takes specific note of the dynamic relationship between the prospect of Turkish EU membership and Turkey’s wide-ranging and thorough-going institutional reforms of 2003 and 2004. Given that Brussels has been an anchor of Turkish reform, the report suggests that in order for this progress to continue, Europe should approach Turkey in a more positive and constructive manner. Indeed, the recent backsliding in Turkey is, in part, due to clear signals from the European public and leaders that they do not support Turkish membership in the Union. Third, Generating Momentum does not “offer up” Cyprus as a “propitiatory gift” in the service of U.S.-Turkey relations. We firmly believe that greater U.S. diplomatic engagement on the Cyprus dispute will benefit Cypriots, Turks, Greeks, and Americans. In addition, given that the Republic of Cyprus is a member of the EU, Brussels is now a party to the conflict and, as a result, faces challenges in playing an honest broker role. According to European officials, the Republic of Cyprus has consistently blocked a number of EU initiatives intended to help resolve the conflict on the island. Under these circumstances, appointing a new special Cyprus coordinator to work with the UN and all the parties, including the EU, is a prudent approach to this very difficult—and sometimes emotional—issue. Mr. Theros and his colleagues spend considerable time addressing the Annan Plan. We agree that the plan was far from perfect, but diplomacy is about achieving what is possible. By the measures of most respected analysts, the Annan Plan offered the best possible means of finally reuniting the island, benefiting the Greek Cypriot as well as the Turkish community on the island. It is likely that any future resolution would in substantial ways reflect many aspects of the Annan Plan. In addition, Mr. Theros and his colleagues are particularly concerned that, in their words, Generating Momentum portrays the Greek Cypriot community as a “spoiler” in the 2004 island-wide referendum on the Annan Plan. It is a fact that the overwhelming majority of Greek Cypriots voted against the plan. Greek Cypriot responsibility for scuttling the Annan Plan is generally accepted among independent analysts in the United States and Europe as well as among many U.S. and European government officials. Mr. Theros and his colleagues correctly point out that former Cypriot leaders like George Vassiliou and Clafco Clerides advocated for the plan, but curiously neglect to reference the current president, Tassos Papadopoulos, who opposed the plan and made this well known to his constituents. There are a number of additional assertions in the letter that are factually incorrect, including claims about U.S. and Turkish policy in Central Asia, Iraq, and the Middle East. In closing, we thank Mr. Theros and his colleagues for the time and effort that they have put into examining our report on the future of U.S.-Turkey relations. They have provided us with an important perspective on U.S.-Turkey relations that will be of value to our future work on this topic. It would be in the interest of all those who care about these issues that we identify more common ground upon which to build an effective American foreign policy toward Turkey, Greece and Cyprus. ^ Ambassador Patrick N. Theros (ret.) has been a member of the Council on Foreign Relations since 2004. He is the former U.S. ambassador to Qatar and president of the U.S.-Qatar Business Council. Ambassador Theros wrote this letter in collaboration with Dr. Van Coufoudakis, professor of political science, Indiana University/Purdue University, and dean emeritus, College of Arts and Sciences, Indiana University/Purdue University; Dr. Athanasios Moulakis, scholar in East European studies at the Woodrow Wilson International Center for Scholars, former director of the Institute of Mediterranean Studies of the University of Lugano, Switzerland; and the Honorable Eugene T. Rossides, former assistant secretary of the Treasury and president of the American Hellenic Institute, Washington, DC. The authors gratefully acknowledge the assistance of the staff of the American Hellenic Institute in preparation of this document. 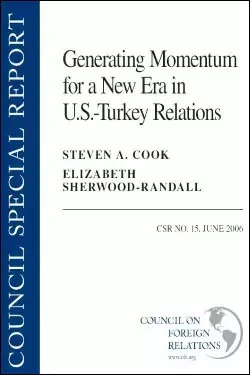 ^ Steven A. Cook and Elizabeth Sherwood-Randall, Generating Momentum for a New Era in U.S.-Turkey Relations, Council Special Report No. 15, June 2006, p. 3. ^ Sedat Ergin, “Turkish PM Said ‘Horrified’ by Bush ‘Ultimatum’ Over Iraq Talks in December 2002,” Istanbul Hurriyet in Turkish (translated), September 20, 2003. See also: http://www.theturkishtimes.com/archive/03/0403/f_wolfowitz.html. ^ The authors further mislead by asserting that Turkey sent 15,000 troops to fight in Korea. The Turkish contingent never exceeded 5,500 men. More to the point, Turkey sent troops to Korea, in part to secure access to NATO membership in conjunction with the Truman doctrine and overcome the fact that, unlike Greece, it did not fight on the allied side in WWII. ^ CSR No. 15, p. 14. ^ European Commission (http://ec.europa.eu/enlargement/questions_and_answers/turkey_en.htm). In July 2005, Turkey signed the Additional Protocol extending the EC-Turkey Association Agreement to the ten new member states. However, since then it has not implemented it to Cyprus. Turkey has continued to deny access to its ports to vessels flying the Republic of Cyprus flag or where the last port of call is in Cyprus. As stated in their September 2005 declaration: “Failure to implement Turkish obligations in full will affect the overall progress in the negotiations.” Member states will review the implementation of the protocol of the Ankara Agreement in the course of 2006. The commission will continue to insist with the Turkish authorities that in order to avoid all possible consequences on the accession process, Turkey needs to meet its contractual obligation to implement the Ankara Protocol fully. ^ Giles Merritt, “ Turkey’s Generals May Be the Real Obstacle,” International Herald Tribune, September 18, 2004. ^ See Steven A. Cook, Ruling But Not Governing: The Military and Political Development in Egypt, Algeria and Turkey, Johns Hopkins University Press, 2007, and “The EU, Erdogan, and the Generals,” International Herald Tribune, April 24, 2007.